I would normally keep this place to myself but I miss all my Gorge friends. 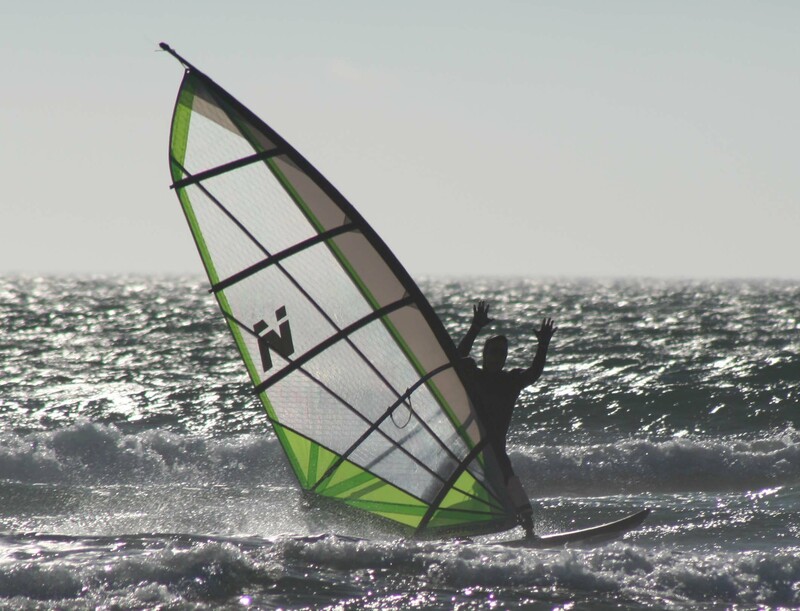 And Tuesday is looking like a classic session: warm water, small well formed surf, high tide in the afternoon, lots of great sailing with consistent wind, plenty of room for all (except maybe parking). Headed your way...... sounds to good to miss! Plus getting a little tired of The Gorge scene. Coasting your way Windfreak; Save some sand for me. Posted: Mon Jul 30, 2007 8:53 am Post subject: Too windy?! I hate to complain when high pressure builds in faster and stronger than predicted, but it does bump up the swell when the wind blows nonstop day and night, and usually ultimately will blow off the warm surface water and cause upwelling of the 38 degree water, with then hugely increases the thermal gradient, resulting in even more wind yet. So the "just right" wind and swell and warm water becomes more of the classic Manzanita picture with the swell/surf blocking the wind in the surf zone, forcing you to overrig to be able to get outside, where it is nuking and wild, water is like ice, and the word "survival" comes to mind more than it should. Not for beginners or the faint at heart. Just a word of caution re the conditions and forecast. Usually the time of year would support continued mild conditions, but global warming seems to be extending our sailing season in both directions, so we may now be entering an early July type period, again! So as my good friend kmf says " you just got to be there, and ready to sail what you get!" He has been having a great year so far. IN OTHERWORDS BRING THE WINTER GEAR ALONG WITH THE NUKING STUFF. OK, COUNT ME IN.
. . . but beer on the beach is colder too, right? Some of us got Manzanita wet today. Check out the chart, it was fairly accurate. A good time was had by all, especially Spruce (HR) who pulled off a great maiden voyage into Oregon's coastal waters, congrats! P.S. 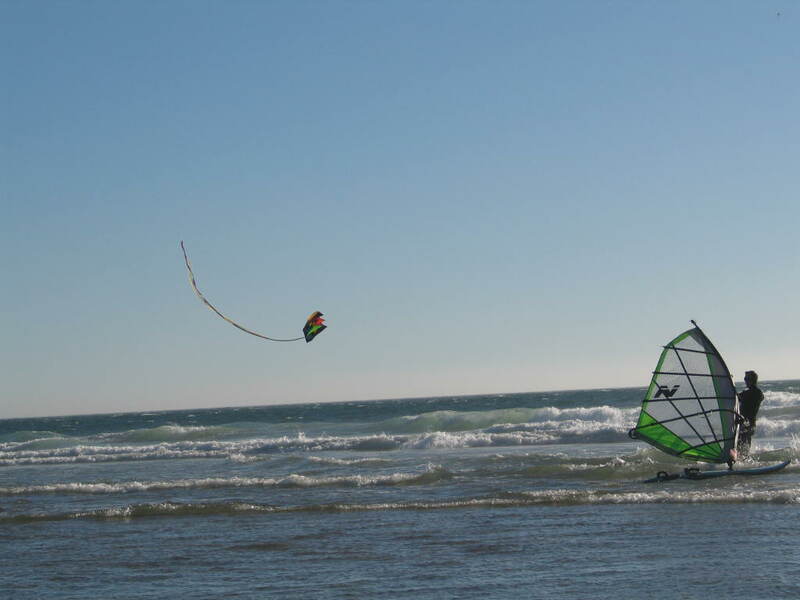 There were some surf antics, as one sailor had a kite flying from his mast until it turned into a sea anchor! The thermal gradient was incredible Wed. with the largest crowd and highest speeds, check out the chart! 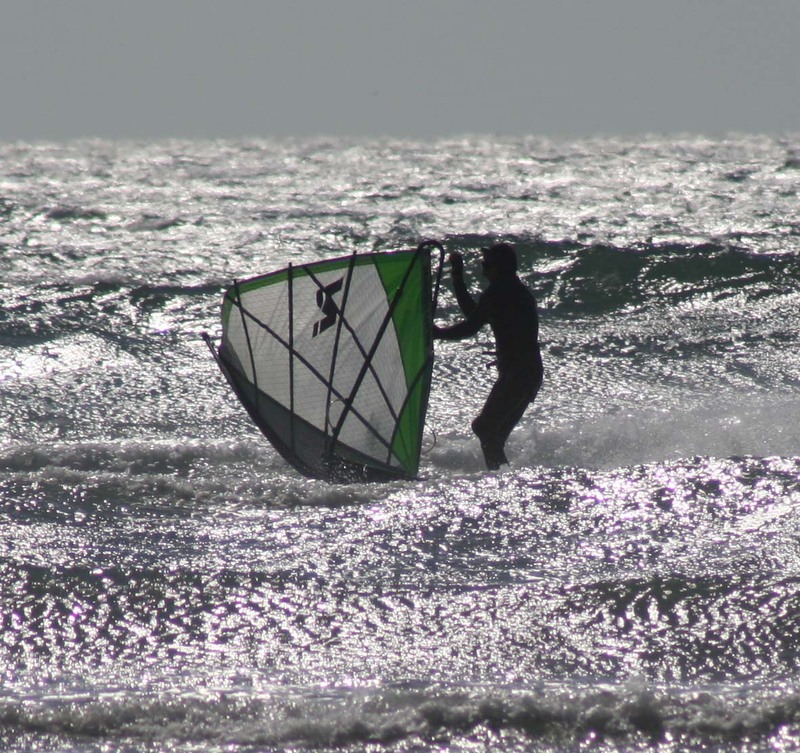 When the wind kicked in with a vengence, only one lucky sailor was ready to take maximim advantage, and was able to make numerous speed runs in the surf zone parallel to the beach. We are talking TERMINAL VELOCITY IN THE SURF ZONE PARALLEL to the beach. Awesome jumps off the ramp of choice. Rarely does the wind and surf set up so well. Well, of course this show drew the rest ,of those lucky enough to be there, into the water ASAP and unknowingly set up a near disaster. Speeds in the surf zone were so high that someone launched in the traditional manner and unknowingly headed directly out thru the surf and directly on a collision course into P's path (visualize pulling out onto a highway, only someone is coming at 95 instead of 55). This miscalulation was almost a fatal accident as the 2 sailors came within INCHES of an extremely high speed collision, neither sailor saw the other until just a few feet apart. It would be interesting to hear from the launching sailor, could it be they were somehow unaware of the sailor making these repeated blasts down the beach!? Lessons were certainly learned on both sides, with a much greater awareness taken afterwards, I'm sure!